Raising Cane’s is now open at 2120 S. 77 Sunshine Strip in Harlingen. 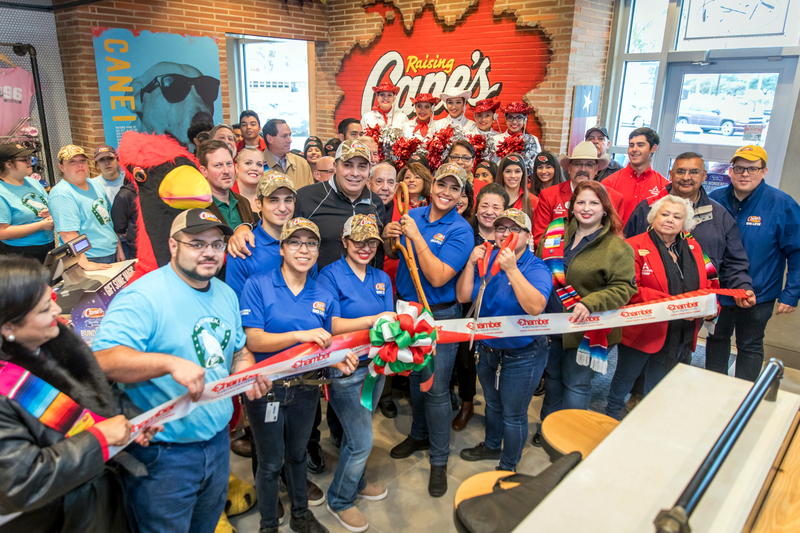 On Nov. 13, Raising Cane’s celebrated the grand opening of its first Harlingen restaurant located at 2120 S. 77 Sunshine Strip. Raising Cane’s hosted a “Lucky 20” drawing before opening its doors and awarded 20 customers free Cane’s for a year. In addition, the first 100 dine-in customers ages 13 and older to purchase a Combo meal received a free limited-edition Cane’s t-shirt. An extra freebie for each of them was a voucher for a free Box Combo. “Caniacs” were in line formation around the restaurant in anticipation for the giveaways and grand opening. Attendees were treated to traditional cheers and other chants to launch the location in Cane’s fashion. Cheers were compliments of its 75 newly hired crewmembers, and Harlingen High School and Harlingen South High School cheerleaders. During the celebration, the Harlingen Area Chamber of Commerce hosted an official ribbon-cutting ceremony. The new Raising Cane’s restaurant also made a $1,000 donation to the Boys and Girls Club of Harlingen. Three popular radio personalities from Wild 104.1, 102.5 La Ley and 90.1 Stereo Hits were also be onsite throughout the day to host giveaways, live radio remotes and pump up the opening day crowd.